Ledecky made the announcement after helping Stanford University's women's swim team to its second straight national championship earlier this month. WASHINGTON — Speaking at the National Press Club on Monday, Bethesda’s five-time Olympic gold medal-winner Katie Ledecky announced that she will turn pro and give up her remaining years of college eligibility at Stanford University. 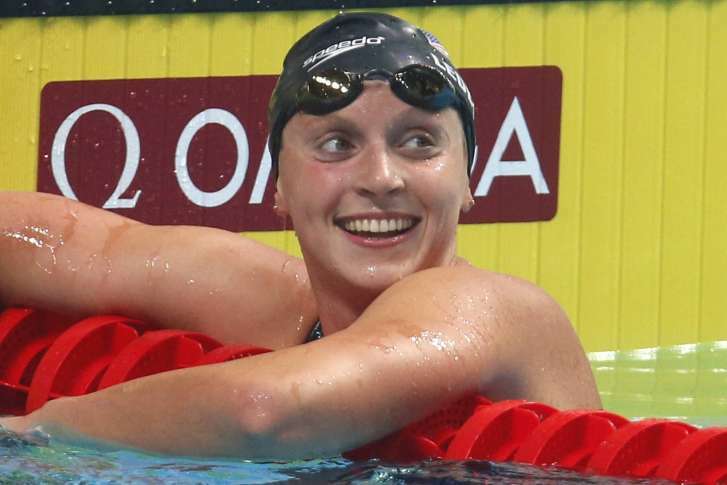 Ledecky won her first medal at the London Games in 2012, and started swimming at Stanford after the 2016 Olympics in Rio de Janeiro. Ledecky’s announcement comes just a week after Stanford’s women’s swimming team won its second straight national championship. Ledecky will no longer be able to compete in collegiate events, but she will swim in professional events for prize money around the world. More importantly, she also will be able to accept money from sponsors. Ledecky grew up in Bethesda and attended the Stone Ridge School of the Sacred Heart. Now 21, Ledecky burst on the scene with an unexpected gold medal in the 800-meter freestyle in London as an unknown 15-year-old. The Tokyo Olympics will be her third.